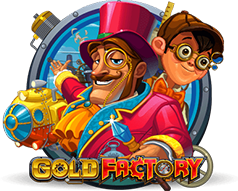 Ditch the mining gear and get rich the high-tech way in Microgaming’s Gold Factory! This online video slot comes with a complex bonus feature and up to 50 lines of fun. Play Gold Factory for free on this page, or go to any of the Microgaming casinos listed below to play for real money. When you first load Gold Factory, use the available controls to decide how much you want to bet. Start with the – and + buttons under the coin, which will change your base denomination. The “Lines” sections lets you adjust the number of active paylines. If you want to bet multiple coins per line, use the “Coins” area. Push “Spin” to begin, use “Bet Max” to spin with the highest possible wager, or push “Auto Play” to spin continuously. Having five reels and fifty paylines, Gold Factory has an industrial Victorian feel to it and the symbols animate wonderfully whenever they form a winning combination. All the symbols are related to the theme and there are some Phileas Fogg-esque methods of transport including a hot air balloon, a submarine and a train. There’s also a couple of characters, a factor and a selection of gold products. The Gold Factory logo is wild and there’s a big gold bonus coin which triggers the main feature. Boiler Room Bonus – this is where the game starts and you must pick 4 places from 12 available on the boiler. You will reveal hidden prizes unless you pick the Free Spins or Reactor Bonus prizes in which case you will play those games. When those games have finished you will return to complete the Boiler Room Bonus. Free Spins Bonus – you will receive a random number of spins between 10 & 35 (obviously the more the better) and then you will be returned to the Boiler Room. Reactor Bonus – you will be taken to the reactor and asked to pick the lit parts until you uncover one of the two Malfunction symbols. Everything else is a prize! The aim is to land the scatter symbols to trigger the feature so if that’s all you want to do then you can minimise your paylines; of course that will lessen your potential wins should you activate that feature so, ultimately, the choice is yours. This is a great slot with some excellent background music and top quality animations; it’s the sort of game which makes you smile just by playing so give it a go. Gold Factory is a very interesting video slot game created in the software company Microgaming. Perhaps not going to be interesting for someone but it is definitely original. The topic is imagine – factory gold. It would be nice to have, or at least to work in this factory where the gold is made but it exists only in the imagination of the designers of Microgaming. I must admit I like the theme and the visual appearance of the game. Here, the main color is yellow – color of gold. Also gold is on the most symbols that you have here and that in various forms of bullion, coins etc. In addition to the wild symbol feature this game offers one more feature that is called Gold Factory bonus. Here you can win cash prizes and get to free spins. You can get between 10 and 35 free spins that can not be retriggered. My only real criticism when it comes to this game is that only in this bonus game you can expect some bigger wins. Symbols in the regular game are poorly paying. You can see that if you look at the pay-table. As much as I love the design of this game it is not among my favorite Microgaming slot games. The reason is that it’s too expensive for me because I am still a low roller player. I played most often here at Microgaming multiplayer slot tournaments. But the last time I played at the Spin Palace Casino. I got 15 free spins from the casino on this game. From those 15 free spins I cashed 6.06 euros. It’s not so bad, considering I’ve played on 30 and not on all 50 lines. I did it in these 15 free spins to get to the bonus round but not to another bonus or the free spins bonus. For the Gold Factory I give high 4 out of 5 possible stars primarily because of the originality and the likable design. Gold Factory, 5 reels, 50 paylines slot by Microgaming. I do like gold but white gold, anything but not yellow please, at least not for me, but to get into the Gold Factory and old times, yes, please, take me there. I tried to remember if I ever visited some old gold factory and its a shame I did not. Since I was a little girl I got much jewelry some very rare pieces are left but I am not even interested to look after it. My uncle worked with gold and anytime he came for a visit I would get one nice piece of gold. Like for my uncle, don’t you agree with me. Hah, he was a kind of mine Gold Factory. This game has a very attractive paytable with max. of 2500 coins. Min bet is 0.50 and that’s the reason why I am avoiding this game big time. But I played it quite much 3 months ago and you can still play Tournaments and it is a Free Roll which means no entry fee and you can get the real feeling and win some cash without depositing. I like the graphic and animations in this game, I like the background sound very much and I feel like everything that is going on in the game is my surrounding. I am a little upset because I was almost sure that I uploaded some screenshots from my tournaments wins and now I don’t see one single screenshot and I don’t know what is the reason nor I can find it on my laptop because I recently deleted many things. I didn’t like this game at first. Free spins feature with Multiplier bonus game which I liked very much. You will see 12 reactors and will be offered 12 items and behind each item is a hidden prize. Boiler room bonus round has 2 levels and will bring lots of joy in your play session if you manage to reach it. Min. bet is 0.50 euro cents and bear in mind if you are depositing your money, take some nice bonus and give it a go! Gold Factory is a great game that I had a chance to play that is powered by Microgaming. Honestly when I was choosing for a game to play this game attracted me due to it’s name and I expected it to have some high payouts. This is a 5 reel and 50 payline slot with a minimum bet of 0.50$ which in my case I played with. I played this game very shortly when I got my first Gold Factory Bonus where you have 12 reactors in front of you and you can only choose 4 of them. Most of these picks are cash prizes but they are two features hidden which are the Free spins and Reactor Bonus. In my first trigger I only managed to trigger the Reactor Bonus where I also had 12 symbols and I kept choosing until I found a malfunction sign that ended the bonus and for the remainder of the uncovered symbols I get compensated with 1x wins. I got almost 25$ out of that feature. Later on as I kept playing i continued triggering the bonus but now mostly hitting only the cash prizes which frankly started to irritate me, since I really wanted to hit both of the features in one bonus play. And after a long time of playing I managed to hit the Gold Factory Bonus where I hit free spins and the Reactor bonus. From the free spins feature i only got 10 FS but the maximum that you can get is 35 FS. After playing all of them and also finishing the Reactor bonus I managed to boost my balance up to 160$. At that point I was really satisfied and I asked for a withdrawal. Overall this is a great Microgaming powered slot that I loved playing and I will definitely play it again when I get the chance for it. Good afternoon, my friends I wish to introduce you guys the next slot game that I have tried so far, the Gold Factory slot game. Gold Factory is a 50 paylines slot game, which is in itself an attraction. Then players can wager up to 20 coins per paylines and that leads to a maximum bet of 1000 coins. When we talk about highest paying symbol, it is about the Gold Factory Logo, which is the wild symbol. The next set of high paying symbols are the man, boy and Gold Factory. After that are a set of transport symbols, which include a train, a hot air balloon and a submarine. At the bottom of the payout table are symbols like gold cart, ingots and coins. In terms of visual satisfaction, the animations in Gold Factory are fantastic. The gold factory comes alive with gold falling down the chute and a mini train moving in the foreground. The animations in the transport symbols are also great to watch, particularly the air balloon flying low over some landscapes. Other than that, the cheerful background music matches with the mood of the slot game. The Gold Factory Bonus is the core attraction of this Microgaming slot game. The multiple level bonus game is initially triggered by three or more bonus coins appearing anywhere on the reels and pays out up to 619,000 coins. Then, when comes to the base game is played in the Boiler Room where gold is discharged from hoppers into a mini train. There are 12 hoppers and the player gets to pick four of them. In addition to bonus credits the rewards can include tokens that lead to another bonus game. After the next level bonus game is completed the player will be returned to the Boiler Room if he has any picks left. One of the main things of this Gold Factory slot game is Free Spins. The player is taken to a second screen where he has to select one of two buttons. He is awarded free spins ranging in number from 10 to 35. The payouts in the free spins are doubled, but the free spins cannot be retriggered. The bonus symbol, which also offers scatter payouts, is a specially crafted gold coin. The other thing that makes me happy is the Reactor Bonus. Here the player is taken to another part of the Gold Factory. The reactor has 12 operational points. The player operates these points and earns bonuses till such time he selects a malfunctioning point. There are two such points in the reactor. When the game ends, for each of the unselected points the player is awarded a compensatory payout that is equal to his bet. This is something worthy to be tried as you guys could stand some chances to win compensatory payout. Gold Factory game is powered by microgaming. I really like this game. I must admit it is a bit expensive since its €0.50 a bet, but there is a chance to win big in this game. There is only one bonus but you can win cash and free spins in it. To get the bonus I had to get three or more bonus symbols anywhere on the reels. Once I got the I entered the boiler room bonus. In there you will be presented with 12 containers and you will have to pick four of them. There is a chance to pick cash, free spins and reactor bonus. I am proud to say that I have had games where I picked all of them. The amount of free spins you get is random. You will have to spin to reels and the number shown on them will be the amount of free spins that you will get. I got 35 free spins good few times. My usual bet on this game would be €0.50 and max I won on free spins was around €45. The reactor bonus is pretty cool too. You will see 12 items and you can pick until you get malfunction button. There have been times when I picked malfunction button on my first go, and I can honestly tell you it’s the worst. Max I was ever able to pick on this bonus was like six times. Max I won was around €24. On average when I get the bonus I win around €20-€30. The bonus is very interesting and fun. I really enjoy it and take my time when I pick them. Gold factory is as precious as gold when it comes to slot entertainment and earn some cash from it. This Microgaming powered slot has 5 reels and whooping 50 paylines. I have played a lot on this slot reason being, firstly it never eats up your bank balance and secondly it is the most widely used slot when it comes to large slot tournaments. The coin value range from $0.01 up to $0.10 and one can bet 5 coins on one line making the maximum bet of $25 per spin. Gold coins , gold factory , train , a man with hat and cap are the main icons.I generally play at low bets like 0.01 per coin but i am amazed by the returns and believe me this slot actually pays you more then any other slot on lower bets. It has features like “the boiler room feature” which is triggered when one gets 3 or more bonus coin symbol on the reels then you are eligible to pick four of the twelve symbols there on the reels and you get some reward for each one of them. Now that is cool stuff and if it isn’t enough then you have round two of bonus feature which one can activate by getting free spin coins or reactor coins during boiler room bonus round which receptively activates the “Free Spin Bonus Round” or ” Reactor Bonus Round”. The Free Spin round will give you 10 to 35 free spins and winning from them will be liable to be doubled . The reactor bonus round will give you 12 items to choose and the round ends when you select a danger logo. Each item has prize behind it so one can get some bank roll pouring in. I have won maximum of 20 free spins in the free spin round and was able to win a total of three forty dollars in that particular game. But hitting the free spin feature or reactor feature is difficult but if you are lucky enough then you can win big. Good Luck. This is another type of GOOD Microgaming slot! As a experienced player and playing online slots i would say that the Microgaming platform always surprise, excites and also satisfy our taste and many other players when we’re talking to slots. They have different kinds of slot theme and i will assure that you will not disappoint if you browse all of it! Well, Gold Factory Slot is a Microgaming slot that is grouped to fierce, luxurious and classical and childish slot. So why did i said that? First the symbols and the theme if you see it you’ll be agreed to what i said and that’s not all the music background is the most important part of “ambiance” of a casino! The music was too exciting, good, playful and its also favorable and exact to the theme! When i’m playing this slot i was always imaging my childhood days and the movie of Willie Wonka where the the gold factory is a factory of Chocolates! That’s nice right !? Playing this slot is not tiring because of the attractiveness and cheerful of this slot even when i’m losing my credits it’s like this slot always force me to become happy i don’t know if it’s a side effect of sound or it’s just too incredible and intelligent to design this slot. I remember when my credits started to deplete i find this pay lines 50 lines 5 reels slot i spin with a bet of $5 with 0.10 coin bet range luckily i struck the 3 free spins symbol. After i play the mini clip of that free spin where a computer screen is there and you will click it up so that from the range 10-35 you will credited with the double winnings! I rewarded 20 free spin at that time and fortunately won over $166 after that ! This slot is pretty amazing and i will say that one of the Microgaming proud to have slot! Amazing slot it’s like a child hood imagination slot! Gold Factory is that slot game where I got exactly what I imagined and predicted simply from just its name. It’s impossible with bearing a name like this to be a ‘serious’ game and right after entering the game the players can see it definitely isn’t at all (I refer here only to visual appearance). In this magical, imaginary world where gold is made by manufacturers, there’s a great atmosphere that suggests the cheerful, carefree life on this land. All of the characters are great, lovely and very well-drawn but the animations when they’re landed on a winning line are priceless and my idol is the boy with backpack. He’s just happily walking and his moves perfectly fit to the background music (which really harmonizes to the game) and it really looks like as if he would actually hear the music. It’s so funny and makes me smile all the time. (I think I would also go in high spirits to work surrounded by so many gold). The pictograms are factory, director, boy other represent the end-product like gold bars and coins and first I thought there are gold transport vehicles too but recognizing the hot air balloon figure it prompted me to doubt in this theory. With 50-paylines, 3 multi-level bonuses and the potential to win more than 600.000 coins the slot can be more businesslike. All of the tricks start in the Boiler Room after getting 3 or more bonus symbols in the main game (the 5 of a kind with Bonuses is worth max. 200.000 coins). 4 hoppers must be chosen out of 12 and all hide some surprises. It can be cash or access to the Free Spins Bonus or Reactor Bonus. In the Free Spins Bonus the win decide the number of spins between 10 and 35 and the winnings under that stage are doubled. At Reactor there are 12 chambers and 2 of them will end the game so the goal is to pick and collect as many as can be until one of the Malfunction chambers reveal itself. My most profitable visit in the factory was when I succeeded to select the proper hoppers and went to all bonus rounds. I got 20 or 25 free spins and maybe I had 5 or 6 picks before I found one of the unwanted items. After all free games and features were finished I could came out with plus €124. Since then I tried it with higher bet (higher than €1.50) but never got the permission to enter the bonus rooms again. The only thing what I dislike is the winning sound, luckily it easily can be turned off. Anyway, it’s a great slot with nice, charming characters and the promise of bigger income. Where to start, it’s a lot of fun playing Gold Factory it’s now definitely one of my favourite MG slots ever to play for sure. Being a 50 line slot doesn’t mean you’re having to play all 50 lines if you choose to gamble and lose a few lines I think its sometimes worth the risk and pays off for me most times when I play. And being able to choose how many lines are also a thing I feel is important and usually helps if I don’t have much to spend on the day not sure if this decreases payback, but if it does I sure haven’t noticed from my winnings when playing all 50 lines. Gold Factory is a very colourful and stylish slot game that can keep you entertained for hour’s and hour’s with its animated bonus features and so on, not to forget big pay off if you’re lucky enough to risk a few Quids and get some lucky spins or even better the boiler room bonus and find the free spins within and also the reactor bonus which I have on more than one occasion for 2 coins bet and I sometimes drop a few lines to even things out with this method I have had some good returns for my bet. Gold Factory is one of the most entertaining slots Microgaming has to offer. It’s no surprise to me that this game has been used often by online casinos to organize slots tournaments. If you want to extract high entertainment value from a slot, then Gold Factory definitely is a very good option. On the background you can hear a catchy melody to bring you right into that adventurous spirit. As the symbols of the name suggests, Gold Factory is where the gold gets produced. Is it capable of paying out huge prizes though? Find out by continue reading! Gold Factory has 50 paylines and 5 reels. This slot contains a wild symbol (gold factory icon) and a top prize of 619,000 in the Gold Factory Bonus game. This game is quite special since it consists of multiple second level bonuses. However, you will never be sure what you’ll get once you’ve managed to trigger this bonus. Keep in mind that the minimum bet on Gold Factory is €0.50 and therefore maybe a bit high for low rollers. I played this game for 1 euro per spin most of the time, unless if it was a slots tournament then I would bet max. The wins during base game were quite moderate for me in most cases with one win of 35x bet size as my peak. The great thing about this slot it seems hard to go broke, because it spits out small wins on regular basis. Now let’s discuss the Gold Factory Bonus game, which gets triggered if you manage to get 3 or more bonus symbols (coins). First you’ll get introduced into the Boiler Room Bonus, which is a room with 12 boilers. You will get 4 picks to choose from. Sometimes I won 30x bet size without some additional prizes, and sometimes I managed to trigger free spins or another bonus called the reactor bonus. The most free spins I achieved were 25, but most of the time I would get 15 or 20 free spins. All wins during free spins are multiplied by 2 btw. During free spins I had one major hit of 150x bet size, and several smaller hits ranging from 20x to 75x bet size. Lastly there is the reactor bonus which also gets triggered through the Boiler Room bonus. During this game you have to keep picking a reactor, which then reveals a prize until you catch two wrong symbols. Then the bonus game ends. In my opinion the bonus games of this slot is what makes this game so great. Do you have a some bonus to grind? Pick this slot because it barely ever swallows my bankroll without giving me some good value for my money.